Migration Assistant + Thunderbolt/FireWire Adapter = huh!? I recently purchased a MacBook Air. After setting it up I decided to migrate my data from an older MacBook Pro. I purchased Apple’s Thunderbolt to FireWire Adapter but it doesn’t seem to work with Migration Assistant. The two computers won’t connect. What’s going on? The connector does work, but not in the way you expect from a wired connection. If you sling a standard FireWire cable between two Macs that have FireWire ports, Migration Assistant does what it should. You choose one Mac to copy the data from and the other to copy it to. The “host” Mac (the one that will import data from the other) issues a code to the “guest” Mac and the two of them make the exchange once you’ve selected the data you want. So great, you now know what doesn't work. What does? When configuring Migration Assistant on the host Mac you’ll eventually reach the Select a Migration Method window. Normally you’d choose the From a Mac or PC option because, after all, you’re connected to another Mac. But this leads straight down the path to Nowheresville. Instead, after making the wired connection between the two Macs, you must throw the guest Mac into Target Disk Mode (restart that Mac and hold down the T key). 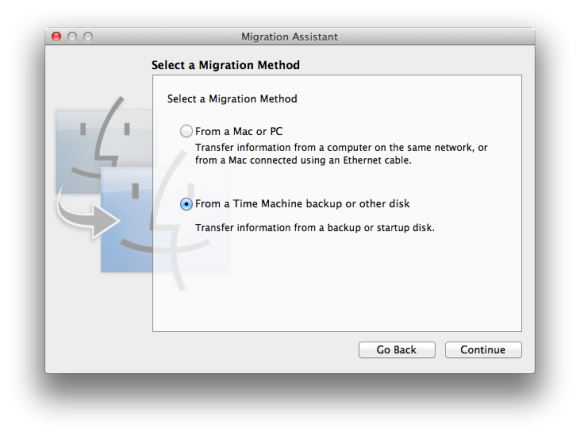 Launch Migration Assistant on the host Mac and in the Select a Migration Method window I mentioned, select the From a Time Machine Backup or Other Disk option and click Continue. The guest Mac’s hard drive will appear, labeled as a FireWire drive. Select it, click Continue, and you can then choose the data you want and proceed with the migration. Or course you could forego this adapter altogether as Migration Assistant works over Wi-Fi and, with a Thunderbolt-to-Ethernet adapter, Ethernet connections as well.